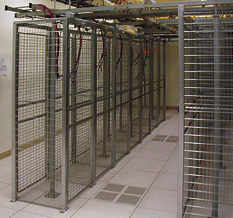 Qwik-Fence® Colocation Cages separate and secure server, communications and network equipment. Variety of cage, cabinet and room sizes available. Quality Construction: Thick 8 gauge galvanized steel wire in a rectangular pattern that is securely welded at each intersection. Galvanized open welded wire provides unobstructed view, allows air circulation and light penetration, while providing security. Panels, posts and doors are all-steel and completely galvanized for long-lasting performance and good looks. Economical: Even with all its advantages, the cost of Qwik-Fence Colocation Cages are less expensive than many woven wire systems. Versatile: Unlike woven wire that unravels when cut, Qwik-Fence welded wire panels can be trimmed in the field to accommodate changes in dimensions, floor or wall irregularities, pipe cutouts and other obstructions. Strong, secure: Qwik-Fence Colocation Cages gets its strength from 8 gauge welded wire mesh and its all-steel construction. Maintenance-Free: Looks new for years to come. Galvanized components are rustproof and maintenance-free—no paint touchups are ever needed. Modular: Component system makes planning, installing and relocating easy in any space. We also offer free design service and our dealers can arrange professional installation. Attractive: Bright steel mesh gives it a clean, attractive look in both office and production areas. Powder coated colors optional. Also available: Numerous door and lock options, extra-high rooms, service windows, ceiling panels and custom sizes and configurations.